How to convert between all popular video formats? You have a portable video player and would like to watch your home video using it? Or you have to create a DVD for your home DVD player? Or you would like to convert a home video DVD to some other formats and save it on your PC? 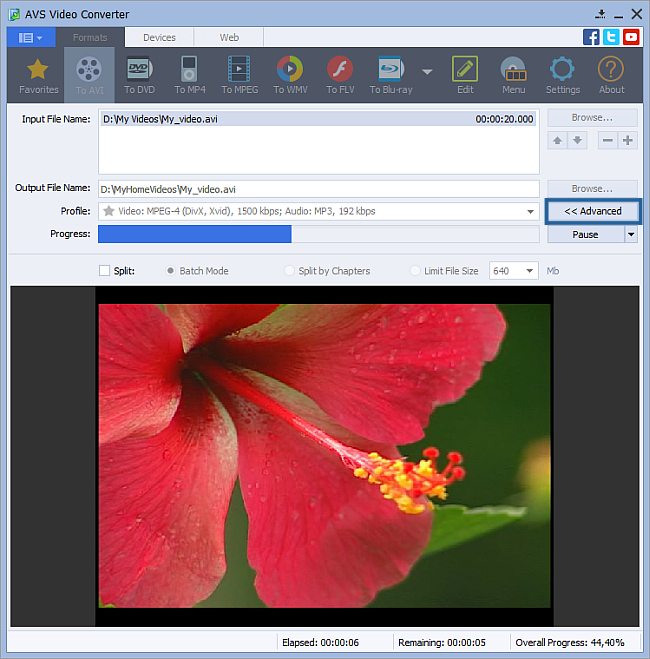 AVS Video Converter enables you to solve these problems quite easily with a few mouse clicks. To WebM for using with HTML5 video to embed high-quality videos into web pages. Note: if you want to convert your video for a specific portable device you can switch to the Devices tab of the Main Toolbar and select the button corresponding to the needed device. If you need to convert your video for a video-sharing website, switch to the Web tab and select the button that corresponds to the desired website. In the list of Profiles (Profile field) select one of the preset profiles. You can also click the Advanced >> button to manually set the profile parameters in the Output File section of the opened Conversion Options tab. You can visually judge the conversion process if you hit the Advanced>> button.